Like sibling rivals, Canada and the United States have similar bloodlines but are wildly different in style and temperament. On this wonderful tour of two nations you’ll have the chance to become intimately acquainted with both. Start in Montréal, one of the most French of Canada’s metropolitan centres, and quintessentially its romantic heart. From there you’ll be ushered into one of the oldest cities in North America, the wonderful Renaissance-era Québec City. Prepare to be carried along a string of gems, from Ottawa to Toronto to the wondrous Niagara Falls, until arriving in the cultivated East Coast of the United States – Pennsylvania, Maryland, Philadelphia and Massachusetts. Amtrak’s Acela Express will take you to Boston, Business Class, so relax and enjoy the superior service. For the next two nights you’ll stay at the Fairmont Copley Plaza or similar. Discover the eclectic East Coast charm of historic Boston. A hop-on-hop-off tour of this historic city will take you to highlights such as Boston Common, Quincy Market or Harvard University. It’s a fabulous city, so just enjoy your exploration. Board Holland America Line’s ms Zaandam and settle into your verandah stateroom for a wondrous cruise escorted by your Tour Director. For the duration of your cruise, the ‘Signature Beverage Package’ has been included. Today you enter US waters as you arrive at Bar Harbor. You’re sure to enjoy charming Charlottetown on Prince Edward Island, the inspiration for ‘Anne of Green Gables’. You’ll be inspired too. 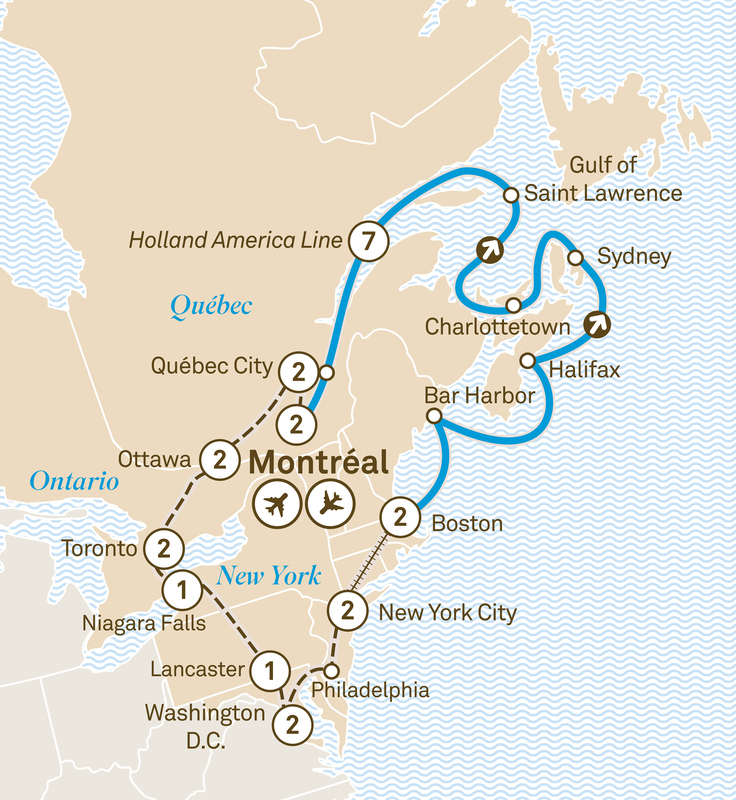 Cruise the mighty Gulf of Saint Lawrence, gateway to North America’s interior. Celebrate your journey at a festive lunch today. Today you’ll get the opportunity to further explore one of the world’s most beautiful cities. Your wondrous journey comes to an end today. Enjoy your onward or homebound flight. Please book flight to depart after 2pm.